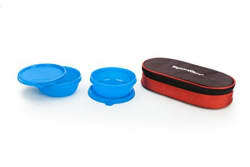 Signoraware s Mid Day lunch boxes are perfect for those brunch type meals or carrying organic boiled preparations. You can leave them on your table and munch from it from time to time. It s a great way to keep unhealthy cravings away. Unique insulated bag keeps food warm, Ideal for tiffin time in school or work.